Health care facility managers continuously focus on fire and life safety issues to remain in compliance with CMS requirements. The CLSS-HC certification is based on the 2012 edition of NFPA 101®: Life Safety Code®, one of the most important codes facility managers must interpret. Demonstrate to your management, staff, patients, and visitors to your facility that you have the knowledge and skills needed to stay on task with these challenging requirements by earning your CLSS-HC. What is a Certification? A professional credential that sets you apart from others and shows your competency of professionalism/expertise in the area of your specialty. Why Certification? Today's public is demanding evidence of competency from professionals in their practice specialties. 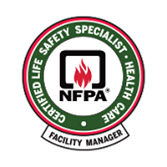 At NFPA®, we understand how important your creditability is to your employers, your peers, and the public you serve. That is why the Certification Programs NFPA offers can signify that you have the experience, education, and knowledge it takes to handle the responsibilities of your job. Our Certification holders provide evidence of their education and experience by passing a rigorous examination required by NFPA as the certifying body. What are the Requirements? For all Certification Programs, candidates must hold a high school diploma or equivalent. Please note that some NFPA Certification Programs have additional requirements. How Do I Learn More? For an entire listing of Certification Programs offered by NFPA, or to contact the Certification Department, go to www.nfpa.org/certification.